FBI: Violent Crime Declined In First Half Of 2010 : The Two-Way "The nation saw a 6.2 percent decrease in the number of reported violent crimes and a 2.8 percent decrease in the number of reported property crimes compared to data for the same time frame during 2009," the bureau reports. From the FBI's 'Preliminary Semiannual Uniform Crime Report'. There was a 6.2 percent decline in the number of violent crimes reported by U.S. law enforcement agencies in the first half of 2010 compared to the same six months in 2009, the FBI reports. 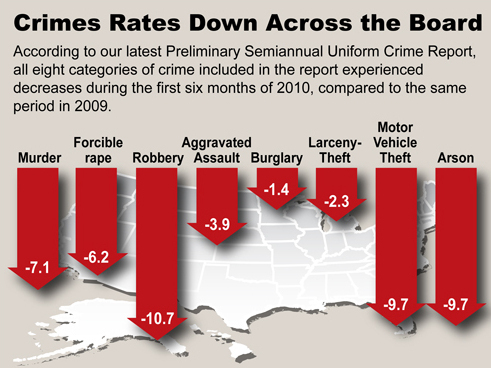 Its Preliminary Semiannual Uniform Crime Report, January-June, 2010, is online here. The bureau adds that "the number of property crimes in the United States from January to June of 2010 decreased 2.8 percent when compared with data from the same time period in 2009."